8 Kms. from Airport, 12 Kms. from Railway Station. 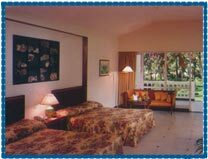 Hotel Majorda Beach Resort, Goa is situated very close to the beach. 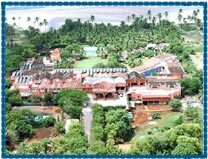 Hotel Majorda Beach Resort, Goa have a distinction of holding the first ISO-9001-2000 certification for a resort in India. This itself speaks for the quality of the rooms that are offered by the hotel. Hotel is situated on a 26 kms long streth of white sands of the beaches of Goa. Apart from this the hotel is situated close to the airport and railway station making it a perfect gateway for a relaxing time as soon as one gets off from the aeroplane. Hotel is spread in well over sprawling in over 20 acres of lush green landscape. Refreshing hydrotherapeutic Jacuzzi, steam and sauna, A fully equipped gymnasium, Water Sports, Discotheque, Mini Casino, 24 hrs room service, Mini Bar, Hair Dryer, Kalari Ayurvedic Massage, Plus a variety of gaming facilities including tennis, squash and billiards. Separate Health & Fitness Centres for Ladies & Gents Indoor & Outdoor Pools, Conference facilities like audio, video, OHP available.